We have a prior engagement up in Humboldt County to take care of nine ducks, one chicken and two cats for some friend’s as they are gone for a month to Vietnam. Heading away from the Mojave National Preserve we have several options on which route we take back up into Northern California. We could head west to Hwy 5 or Hwy 99 or even all the way to 101 and head north. Those routes are more direct but also pass through urban, crowded, less scenic areas than some of our other options. When in doubt, take the scenic route. 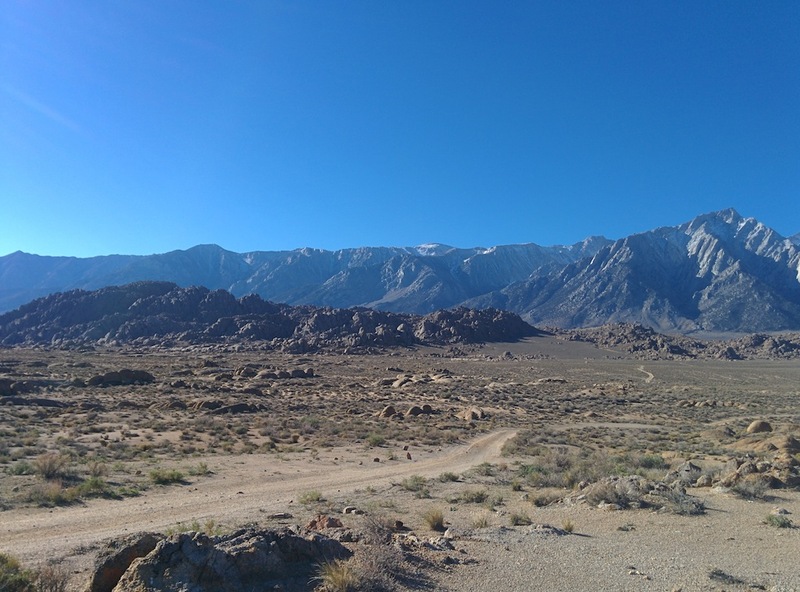 It’s been a long time since I was in the stunning high desert Owens Valley area so we decide to take Hwy 395 north towards Lone Pine and into the valley sandwiched between Sequoia and Kings Canyon National Parks to the west and Death Valley National Park to the east. 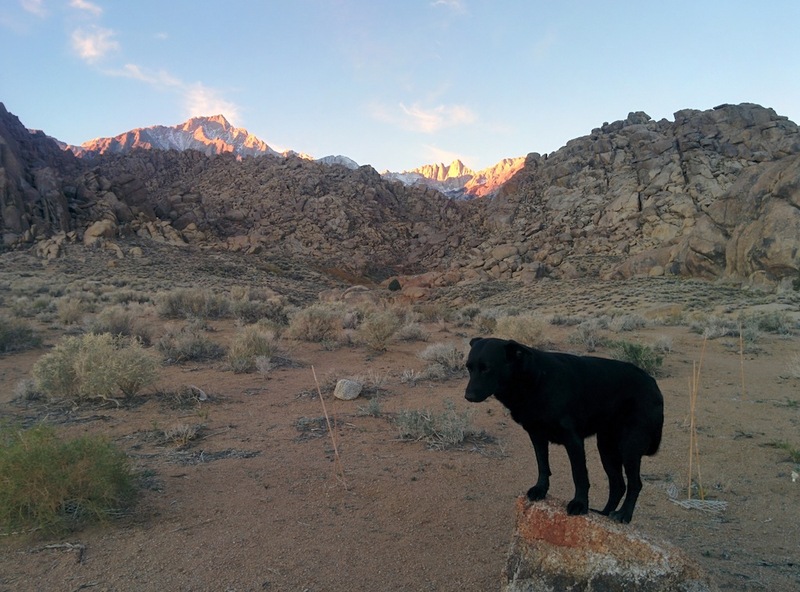 Driving through Bishop California we stopped at the local BLM office and asked about dispersed camping opportunities and was directed to the Alabama Hills. Almost two decades ago a close friend and I decided we were going to hike to the top of Mt. Whitney. To give you an idea about how long ago this was, when we came down off the mountain and back into civilization we heard the news about Princess Diana’s death a couple of days beforehand. My friend was already in the Lone Pine area doing some stream biologist work and I flew down in another friend’s private plane into the Lone Pine Airport to meet him. 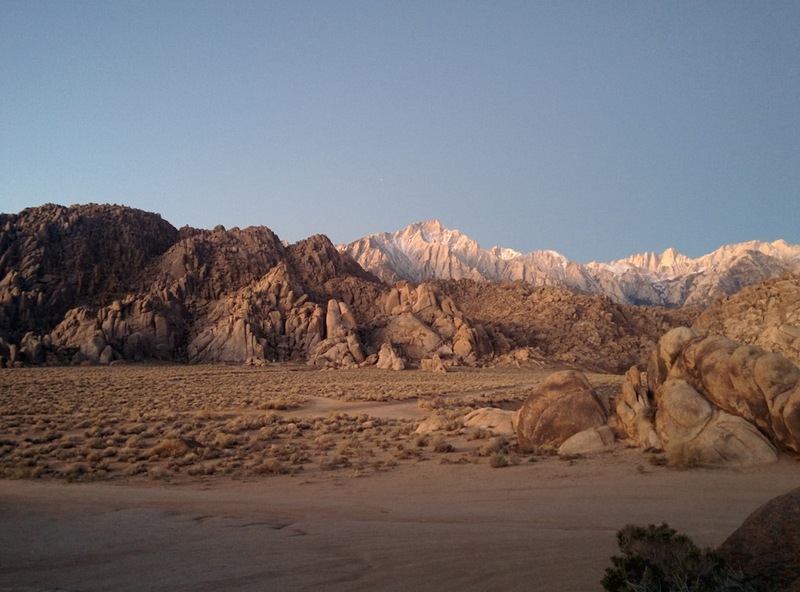 As we drove up the road to start our hike at the Whitney Portal we passed by the sign for The Alabama Hills. Weird name for a place in California we thought but we were on a mission and couldn’t stop to explore then. Willow and I intend to make up for that on this trip. 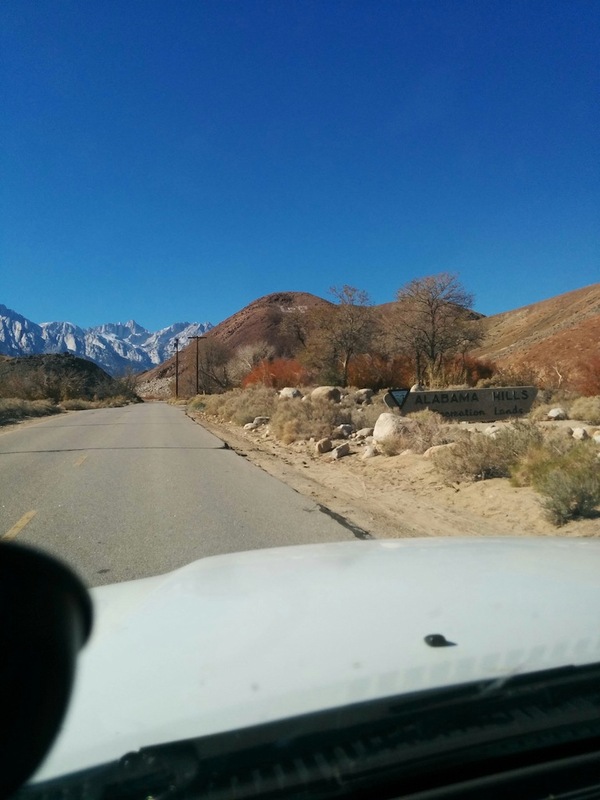 We stopped in downtown Lone Pine to get a few supplies and then headed west up Whitney Portal Road. About two miles up the road we come to the Alabama Hills sign and a small information kiosk and make a quick stop. 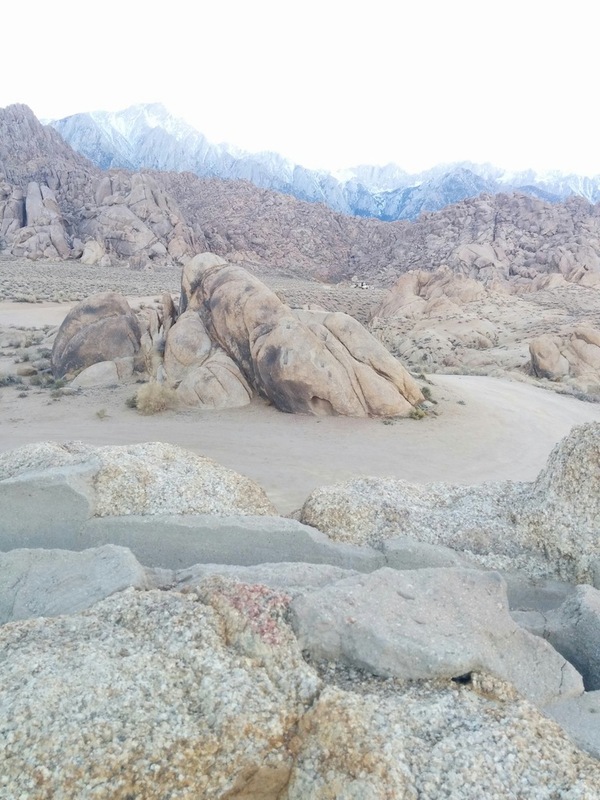 Another mile up the road and we come to Movie Flat Road and turn into the Alabama Hills and history. It’s early enough in the day that, even though we don’t know for sure where we will be camping tonight, we have time to drive around and explore as we look for the perfect spot. It’s nicely maintained dirt road with a few intermittent sections of mild washboarding and almost any vehicle, 4-wheel-drive or otherwise, can get around in here easily enough. This is made all the more apparent when we drive up towards the Meatloaf/Hoodgie Wall campsite and see a huge Class-A motorhome all set up for some glamping (glamour camping). As we drive by we can hear their generator throbbing along and see a huge flat screen TV on inside the behemoth (totally missing the point of being out here) so we decide to go in another direction. We end up several hundred meters away where we can no longer see or hear the Class-A monstrosity and start to unpack and set up camp for the evening. While getting situated we start seeing rusty metal strewn all around the campsite. 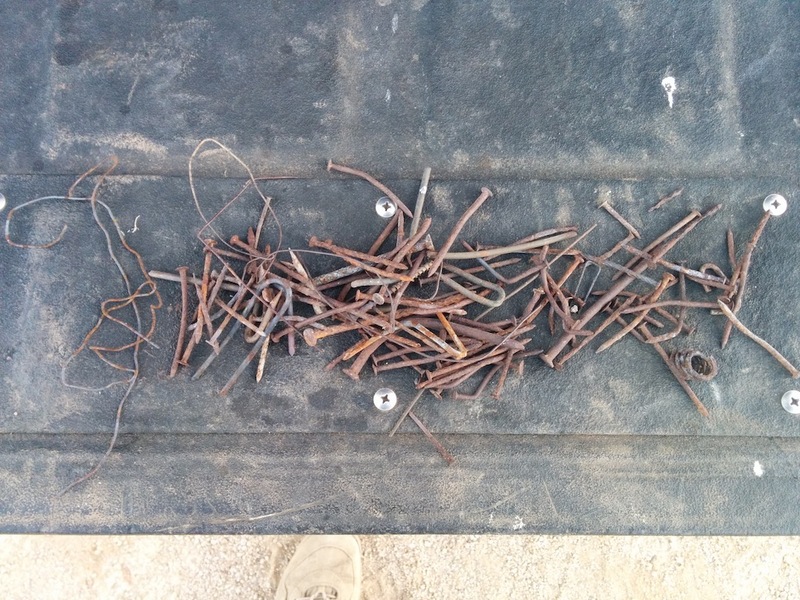 Mostly nails but there is also bailing wire, fence staples, brads, springs, spent firearm cartridges and more. 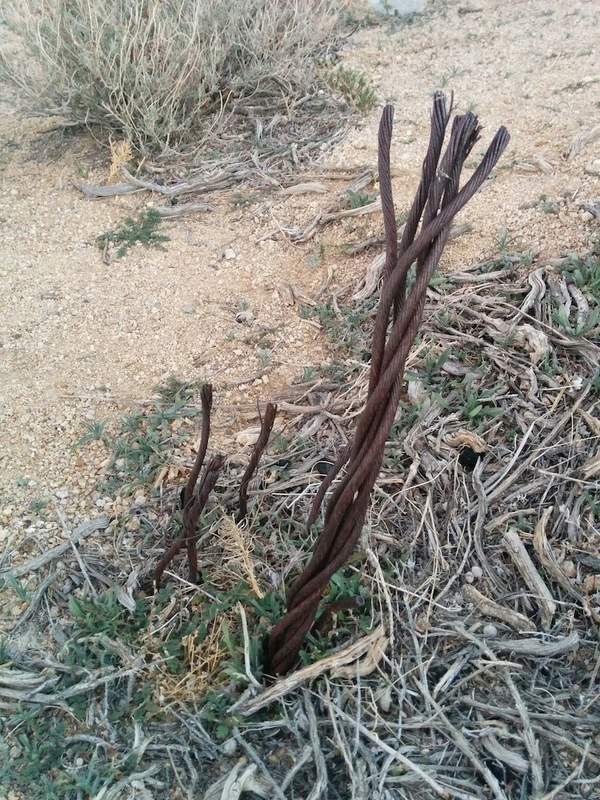 Plus there is a big piece of frayed and rusty cable sticking out of the ground just waiting to impale anyone who trips on it. 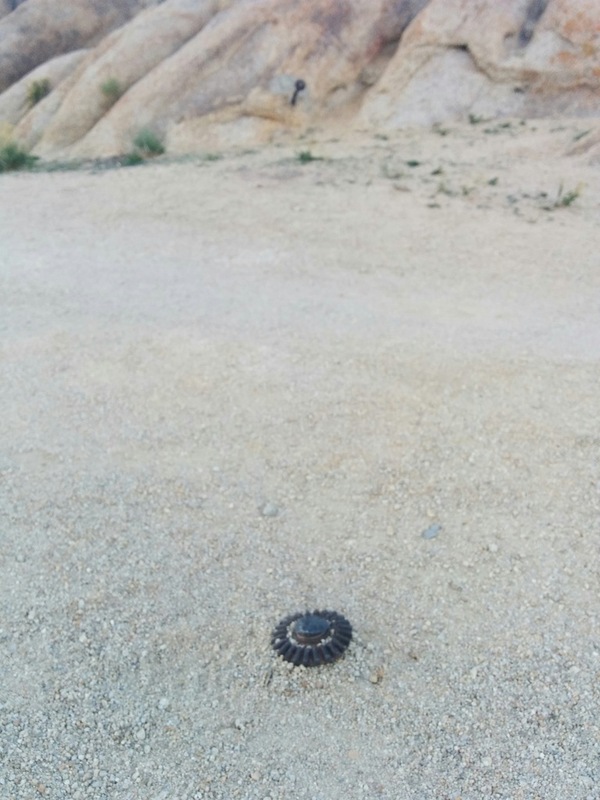 Our BFGoodrich All-Terrain A/T KO2 tires are relatively new and I’d hate to get a puncture so we stop everything and start policing the area for nasty little tire killers. The pile got much bigger. A mere 10 minutes later and we had a pile of sharp, rusty items bagged up and away from our Tacoma’s shoes. In the next 24 hours the pile grew into several pounds of items that don’t belong on the ground of a campsite. 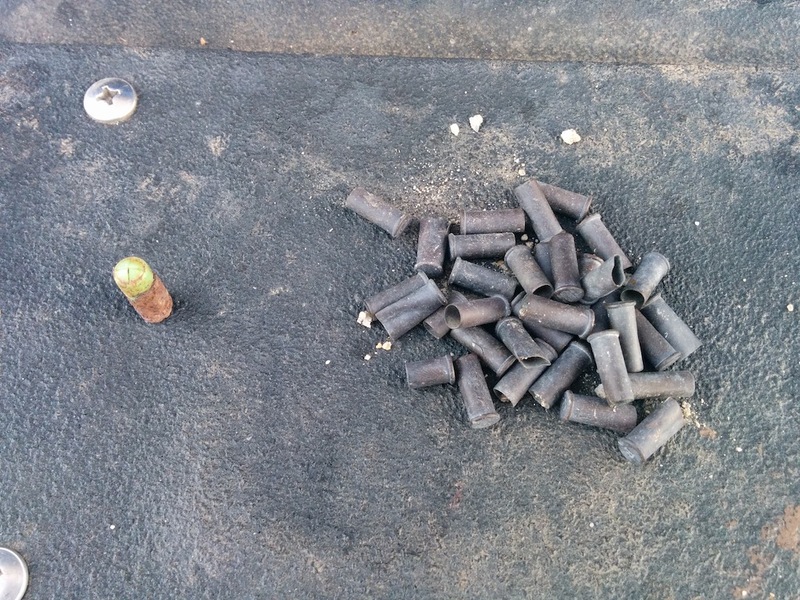 Sadly, we also were able to add to our Poop Karma© points total by cleaning up several loads some previous thoughtless people had left and I’m pretty sure not all the loads left behind were canine. Nasty bastards. That bag of sharp, rusty things and nasty, stinky things was so malodorous that we moved it downwind of where we were hanging out. When we left a couple of days later and brought it with us to dispose of properly it was too stinky to bring it in the Tacoma’s cab or shell so I tied it to the shell’s rear window handle. If this was my BMW I would be upset but this is a truck and that adds character…right? 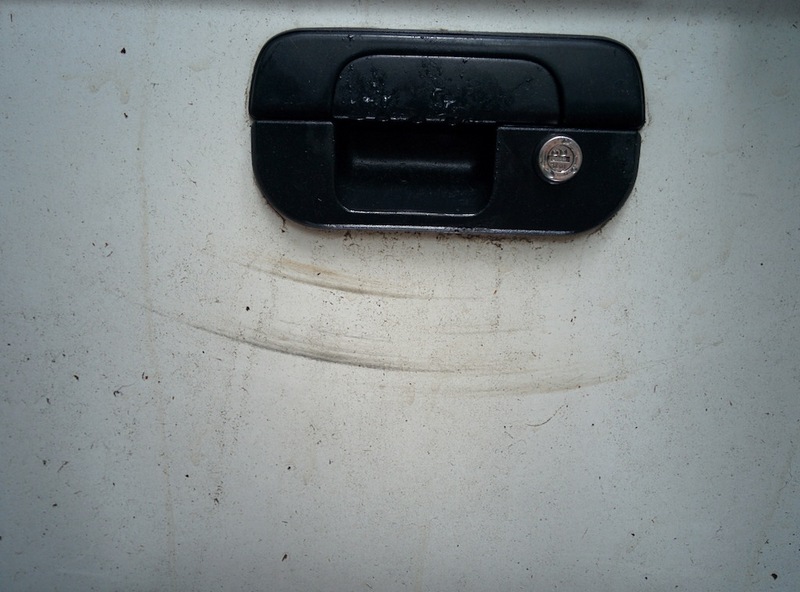 Sadly, the back and forth swinging of the bag just during the few miles back down into Lone Pine added some unwanted “character” to my tailgate. We’ll come up with some other transportation method the next time this issue crops up. But back to happier subjects like the magnificent 360 degree views from our spot. The panorama turned out a little weird but you get the idea. Click for a larger version. The next morning we took a short walk around the campsite’s immediate surroundings. 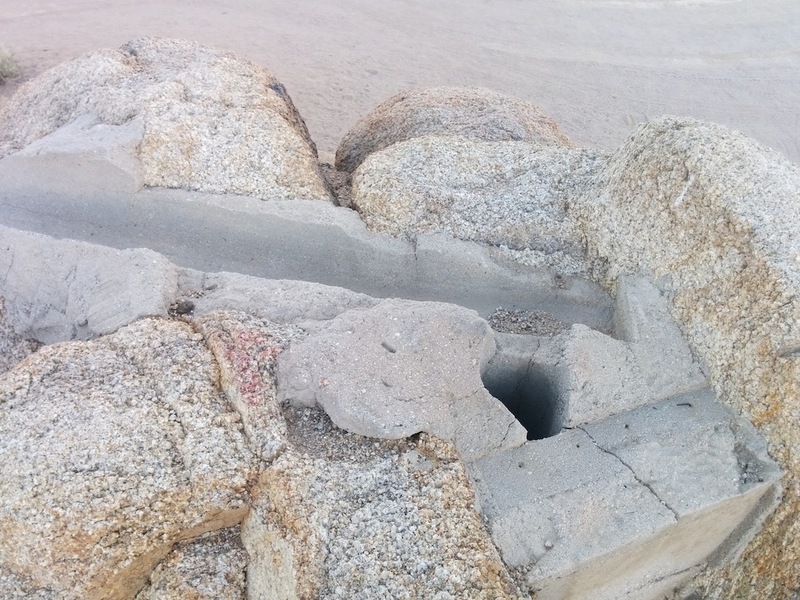 We were still a little disappointed in all the refuse we had found and picked up the previous evening and, for about 10 minutes, became incensed at what someone had done to the rocks right where we were staying. 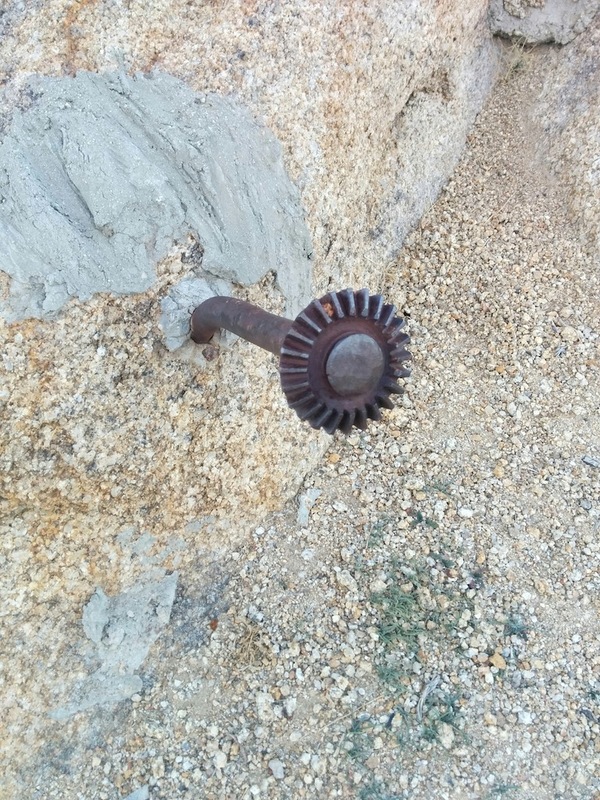 There was even a couple of rusty metal posts and gears left embedded in the rock in the middle of the access road to this camping area. Leftover mining equipment? 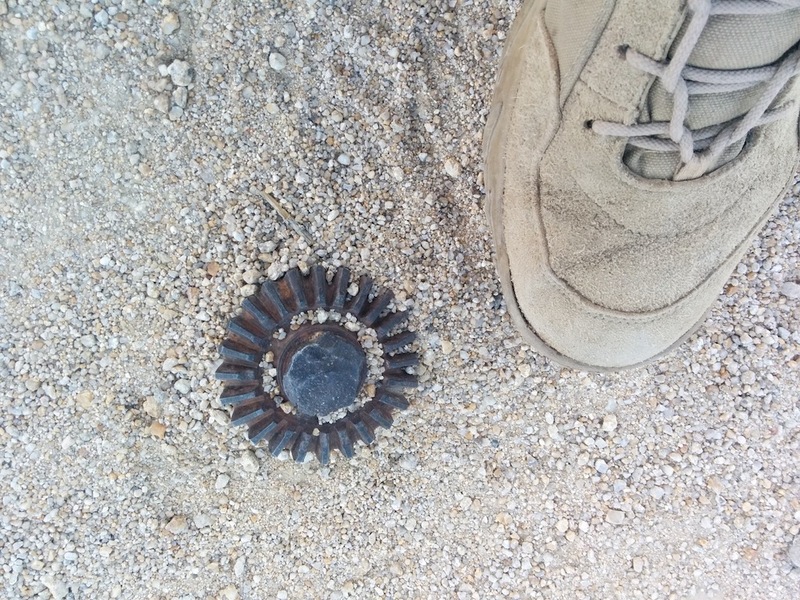 This gear is at the top of the picture below. For those 10 minutes we were angrily trying to figure out what this was from and who had left it. Then it hit me! <Insert Homer Simpson “D’oh!” here>. What road are we near? Movie Road. What do they do here? Make movies. Ah ha. 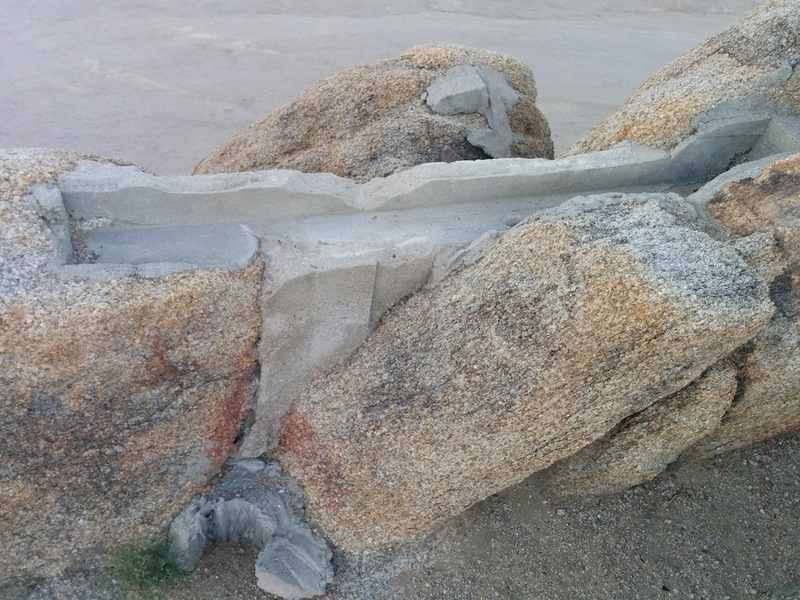 So we get out the little movie road brochure we picked up at the BLM office and figure out that this is what is left over from the famous bridge in the 1939 epic Gunga Din! 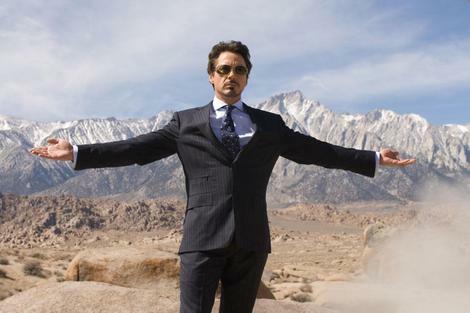 How it looked in the movie. Really only 6′ off the ground. Kinda sorta neat (although I still wish they had cleaned up after themselves but, it was a different time back then). So, anger assuaged, we continue to look around our campsite. Alongside the road that heads from our spot back towards the Meatloaf Campsite there is a steep arroyo. Looking down into it and we can see lots of man made junk including the front and rear halves of a (probably) 1930’s automobile. 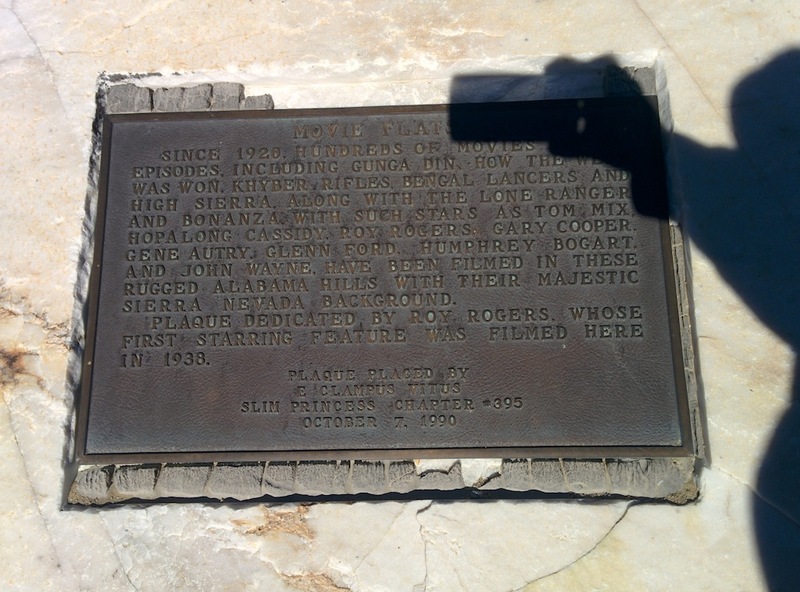 The movie road tour brochure says this was a favorite spot for sending horse-drawn wagons over the edge in countless movies and television shows, most famously in How the West Was Won, Hell Bent For Leather and Rawhide. So, kind of neat to be camping among the history and left overs of hundreds of movies and TV shows. We’ll make it a point to rent Gunga Din and a few of the old classics that were shot here when we get back near usable Internet access. I think we found it but there were a couple of tents right at that spot and we didn’t want to disturb those people so we just settled for something close. We continued on our wanderings in the Tacoma even finding a few spots where 4-wheel-drive came in handy. This truck rocks. Back at our campsite we settle in for another night with a good meal, a little reading in nice, natural light and a small campfire. The only reminder that we are anywhere near snivilization is the continuing appearance of Chinook Helicopters flying overhead on training missions day and night. 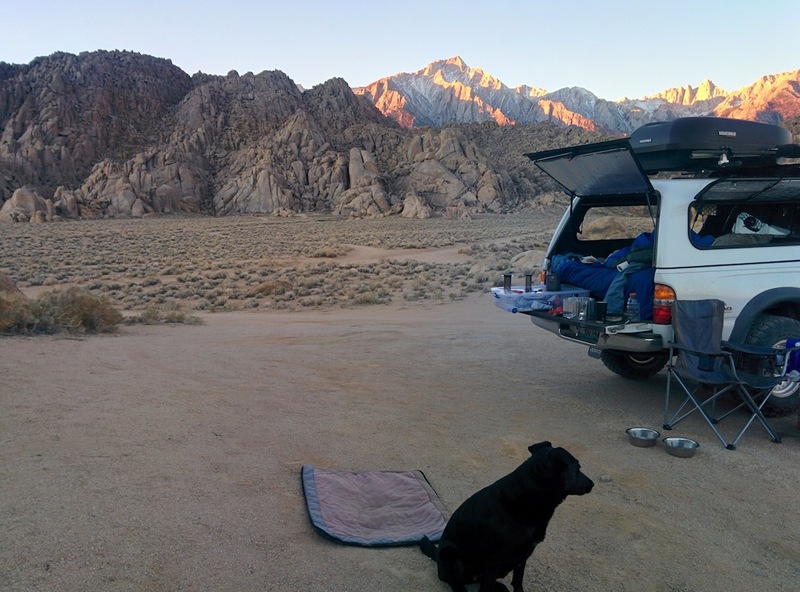 The next morning we pack up our gear and head out of the Alabama Hills. We love this area and have only scratched the surface of what there is to find. We will definitely “Explore Some More” the next time we are in the area.